The most striking features of Gol Gumbad are the seven-storied octagonal spires at the four corners and the heavy bracketed cornice below the ramparts. The Gol Gumbad was built by Muhammad Adil Shah in the year 1656. Constructed at his orders before his death, the gigantic Gol Gumbad dominates the landscape of Bijapur for miles around. 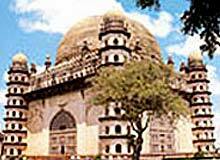 The Gol Gumbad or Gol Gumbaz has a floor area of 1700 sq., height of 51 m. and a diameter of 37 m. The walls of the mausoleum are 3 m. thick. The dome contains tombs of Muhammad Adil Shah, his two wives, his mistress, his daughter and grandson. The structure in front of the tomb has been converted in to a museum. Other prominent structures in the Gol Gumbad complex are a mosque, a Naqqar Khana, a gateway and a dharmashala.